Claw: The witch does not have a real, physical weapon. Her weapon is her long arms with claws. Horribly and excessively large, her deformed claws finger the survivors and thus make their way through flesh and bones. Triggered (Phantasm traps): The witch possesses a special, demonic power that springs from her blackened finger. It is also the trigger for her horrible power. With M2, The Hag paints a dark icon on the floor, whether it's mud, wood or stone. This drawing, which looks like a triangle, is subject to her will and is a trap for her victims. For this simple ritual drawing can produce a deceptive duplicate of it, which is formed of mud and mud. The illusion appears fast-paced and almost frightens the victims to death because they produce crazy heart-pounding and the hunt-music sounds before the illusion disappears after a few seconds. If the trap is triggered, The Hag has two possibilities: it gets the ability to teleport immediately to the triggered phantom trap. But it must be within a radius of 32 meters. Or she keeps the survivors in the belief there (bait) and stalks herself in time to a victim. In addition, when enabled, she gains the ability to create and maintain 10 additional Illusion Traps. With The Hag also finds a new game mechanics in the Horror game Dead by Daylight. Every new killer has always provided for a rethink. This means that both the killer and the survivors have to adapt their strategies. The Hag, unlike all other killers, is very small even smaller than the survivors. You will notice when you are moving through the reeds or tall grass. This can be a disadvantage for you as well as an advantage. For example: you see less because you cannot really get over high obstacles. But don’t see the Survivor right when you are behind these obstacles or sneaking through the high grass. Use this, even if the Survivor hear the heartbeat, they don’t necessarily know where you are. - Enter the Illusion: You can now go to the trap and to the affected Survivor and hunt him. However, you are unable to move for about 3 seconds when you appear at the position. However, it can be useful if you are carrying yourself to the triggered situation if you are not currently dealing with another survivor. - Use the illusion as bait: Since the duplicate of you also causes terrible heart palpitations and makes the hunt music sound, you can also make the Survivor afraid and leave him to believe that you would be immediately there. It is especially wise to move from another side to the other, if you are in the immediate vicinity. The time on the ground is visible. It is best to see it on the bridge or in the house, on the ground, where the survivors have good insight. However, it is only relatively weak to see. It can be seen on the floor like a painted triangle. However, in the zeal of the battle, a Survivor will probably not recognize or take care of it. However, if a survivor has seen a sign painted and a trap, he has the opportunity to "defuse" it by lighting it with a flashlight. As Survivor you have to decide anyway: Stay in place or run away? This is entirely dependent on the situation. But even if you see as a survivor that The Hag is just chasing another survivor, it may be that she is leaving this person and teleport to you instead. What is real and what is only illusion? You have to decide and have only a few seconds for it. By the way, the witch does not seem to be quite as fast as other killers. It is questionable whether this is still adjusted. 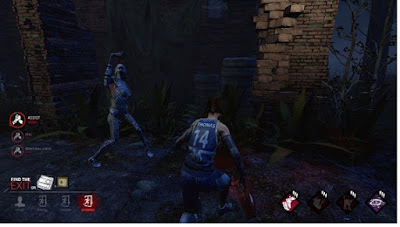 As Survivor you have to search, destroy and find the 5 totems. This is the only way to override your perks. - Orange shining curses: When Survivor run, they leave clear marks on the ground, which like a fir tree glow glowingly on the ground, trees and walls. They look like scratches, you can hardly overlook them. If a survivor is running near you, then you can see these tracks for a time. You also see blood on the ground when one of your victims is already hit and injured. So be careful. - Circling and croaking crows: The crows also tell you when your victims are nearby. Running survivors past crouching crows, then they are choked and croak. If crows are circling in the sky or above the ground, then a victim is in the same place and moves hardly from the spot. So trust the crow. - Acoustic and visual noises: If an acoustic and visual (luminous) signal is emitted, then either a generator has been made, a skill check has not been made, or the survivor has just jumped with a shift over an obstacle. In the case of the Hag, this can also mean that one of the victims has just been tapped into a trap. If you turn now, you also see for example whether it was a generator. You can also hear your victims groan and moan when they are hurt and close to you. Keep an eye on it. You can also see the red, where the generators are located and the hooks. At the beginning of a game, you should always run the generators, since here the Survivor must definitely go, if they want to escape. The witch can also see red marks, where she has already laid illusion traps. It looks like a red line on the floor. The witch's perks are based on a new game mechanics. Because there are now Totems in Dead by Daylight. These are distributed on the map. There are a maximum of 5 survivors. The Survivor must destroy the totems as they curse them and make their abilities limited. - Ruin: This perk influences an ominous totem that directs the survivor's ability to repair generators. If Survivor is affected by this perk, the effect of the skill checks changes. If you do a skill check, then there is a regression, so a decline in progress. In addition, you will not get a big bonus on Great Skill Checks. This effect will persist as long as the corresponding totem has not been destroyed. - Devour Hope: One of the hex totems rooted in hope. But it is a false hope that grows in the survivors: If a survivor is saved from the hook, if The Hag is at least 24 meters away from it, then that perk is activated. It gives you the ability to make double damage (NOED) and kill the survivors with their own hands (Memento Mori) after 5 rescues from the hook for a certain time. This effect will only persist as long as the hex-totem is associated. - The Third Seal: This seal curses the survivors when you hit them. However, this is only valid as long as the Hex Totem is active, which ensures that the aura readability of the victim loses 100% of its effectiveness. Thus, the survivor becomes an easy prey. However, on stage 1, only the two last hit survivors are affected by this curse. If you fall into another survivor, the curse will pass over him. This curse effect will only persist until the totem is destroyed.